The new S&P Case-Shiller Index for November 2015 for the 5-county, San Francisco Metro Statistical Area was published yesterday. According to C-S, home prices continued to tick up a small bit through the autumn market. Most of these charts track the “high-price tier” of homes (the upper third of home sales by price), which apply best to San Francisco, southern Marin, San Mateo and central Contra Costa counties. However, note that appreciation rates do vary by market area. At this point, the next real indication of where the homes market is heading will come after the beginning of the 2016 spring selling season (which can begin as early as mid-late February) and sales begin to close in March and April. Since the recovery began in 2012. One can see in both the above and below charts the extreme seasonality of home price appreciation over the past year and over the past 4 years. Almost all the significant appreciation has been occurring in the spring selling season, when the supply and demand dynamic has been most out of whack, and the competition situation between buyers for new listings has been the most ferocious. Whether this spring will experience this frenzy once again, or whether an inflection point has been reached (for any of a number of potential reasons) causing a more extended plateau in appreciation or even a negative adjustment of some magnitude will soon become evident. Paragon’s full report on the S&P Case-Shiller Home Price Index for the Bay Area is here. Architecture, views, probates, penthouses, lofts, TICs, luxury homes, mortgage rates, sales prices, market cycles, and everything else we could think of in a look back on 2015. Despite anxiety about interest rates, financial markets, housing affordability, unending international crises, and possibly over-valued, high-tech unicorns, the Q4 2015 San Francisco median house sales price, at $1,250,000, is up about 11% from Q4 2014. That dovetails nicely with the S&P Case-Shiller Home Price Index for the Bay Area, which measures appreciation in a different way, but also calculated 11% annual appreciation (through October, its last report). The Q4 condo median sales price, at $1,125,000, is up 13% year over year, but that is influenced by the greater percentage of more recently built, and more expensive, units in the sales mix. San Francisco has seen 3 extended periods of home construction: The first ran from the Gold Rush to the 1906 earthquake, when 28,000 buildings were destroyed. The second went from the post-quake rebuilding, with the construction of thousands of Edwardian houses and multi-unit buildings, through the big WWII population surge. Many districts such as the Marina and Sunset/Parkside were built out in the period from 1920 to 1950, with Spanish Mediterranean (in many variations), Marina-style and Art Deco being common architectural styles. The city’s population then went into major decline during the subsequent 3 decades and construction plunged. The third era of homebuilding is all about new condo construction, which began around 1980, ebbed and flowed dramatically with the economy, and is currently booming once again. A look at a few of the distinctive niches of the market. San Francisco is famously a city of gorgeous views. For the simple reason of verticality, more condos have views and, generally speaking, more panoramic and spectacular views, than houses. Many other lovely views add to SF home value as well: sweeping city views; park views; marina views; views of Alcatraz, Marin and Mt. Tamalpais; and of the East Bay and Mt. Diablo. A few lucky (typically, very affluent) condo owners have staggering vistas from the windows on all 4 sides of their high altitude units. After being bludgeoned in 2015 by thousands of articles, predictions and warnings regarding interest rates, here is a look at how much they actually changed over the course of the year: approximately one seventh of one percent. Per recent signals from the Fed, presumably mortgage rates will rise in 2016, but expectations over the last 6 years have been confounded far too often to be sure. Significant increases would certainly worsen the affordability equation for homebuyers financing their purchases. The 2 charts above illustrate the extreme seasonality of the market, both in the numbers of new listings coming on market, and the percentage of listings that accept offers (a measurement of supply vs. demand). The second chart also shows that the market for homes under $2 million has been hotter than the luxury home market: There are fewer buyers at the ultra-high end, and luxury homes are also most prone to significant overpricing. The spring selling season – which actually started in February last year – is typically the most feverish, and this is especially true for luxury homes: Notice, in the 2nd chart, the huge spike in demand for luxury homes last spring. High-end home sales hit new peaks in spring 2015, but with the stock market volatility in late August and September, the market softened, inventory increased (to its highest level ever) and sales dropped about 17% in October on a year-over-year basis. (Affluent buyers and sellers are most influenced by financial market volatility.) However, the stock market then recovered and stabilized in October and buyer confidence improved, which is reflected in the year over year increase in sales that occurred in November and December. Remember that closed sales in one month generally reflect the heat of the market in the previous month, when the transaction was actually negotiated. Q4 2015 sales ultimately ended slightly up from Q4 2014. 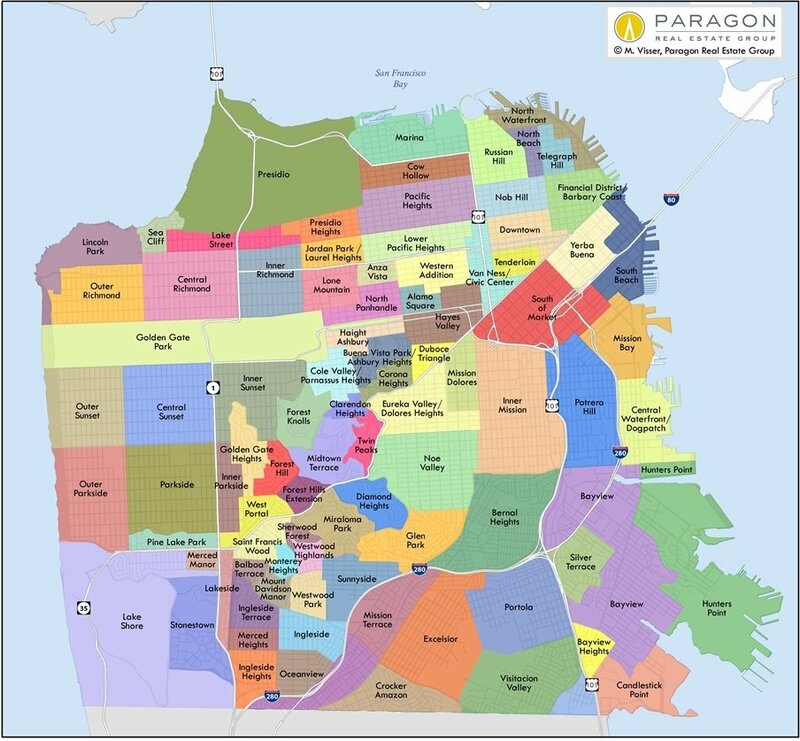 One of the reasons the Pacific Heights district has by far the highest house prices in the city is that its average house size is so much larger. However, its mansions also command a very high dollar per square foot value, as seen in one of the earlier charts. The sales of condo shall continue to make up a larger and larger share of overall home sales in San Francisco, as new condo construction continues apace. (Condos also turn over more often than houses.) Very few new houses are built in the city – they are usually big, high-tech, beautiful and costly. San Francisco is very much a boutique market for multi-unit buildings: Our apartment buildings are generally much smaller, older and, for that matter, more gracious than those found in the suburbs. These properties are often at the heart of fierce controversies pertaining to rent control, tenants’ rights, tenant evictions, and condo conversion rules. There has been an immense increase in market-rate rents over recent years – SF is the most expensive rental market in the country– though rules restrict increases for existing tenants of buildings built before 1979 (i.e. almost all of our multi-unit properties). The tenancy-in-common unit with an exclusive right to occupy, aka the TIC, is a property type rarely found outside of San Francisco. It was originally created as both a way to get sellers of multi-unit properties significantly more money – the individual unit sales adding up to more than the purchase of the entire building by one buyer – as well as providing a lower-cost alternative for homebuyers, since TICs typically cost 10% to 15% less than comparable condos. (The TIC phenomenon also generated significant legal fees for the lawyers who came up with the idea.) Because of changes in tenant-eviction law and condo-conversion rules, financing and other issues, the number of TIC sales has plunged since its peak in 2007. On the other hand, some TIC units are now selling for jaw-dropping prices: In 2015, 4 sold for over $5 million. The median TIC sales price last year was $947,000.